Rated #5 Cigar Aficionado's Top 25 cigars of 2011! Padron Anniversario Serie 1964 was introduced in 1994 to celebrate the Padron family’s 30th year in business. Made with sun-grown natural and Maduro wrappers and a blend of tobacco that is aged for a minimum of 4 years, these are some of the best cigars on the market. Box-pressed construction allows for a perfect draw while masterful rolling ensures a straight burn, and the aged Nicaraguan tobacco in the blend makes for notes of wood, nuts, and spice with an unbelievably clean finish that earned the Serie 1964 a 95-percent rating from Cigar Aficionado. Padron 1964 for under $10 a stick(wow).They arrived fresh & were really good. I will defiantly reorder these!! The best never rest! Once you have a padron cigar no other cigar can match the flavor burn or prestige of a Padron! Natural or Maduro, you will be amazed as I will not reveal my favorite wrapper because it will do a dishonor to the brand! You be the judge. Excellent taste, smooth, durable performance. I really enjoyed this smoke. The cigars were very consistent throughout the 25. I will buy another. 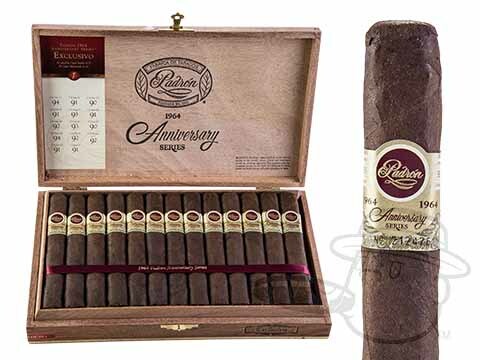 Padron Anniversario Serie 1964 Exclusivo Maduro is rated 4.9 out of 5 based on 7 customer ratings.